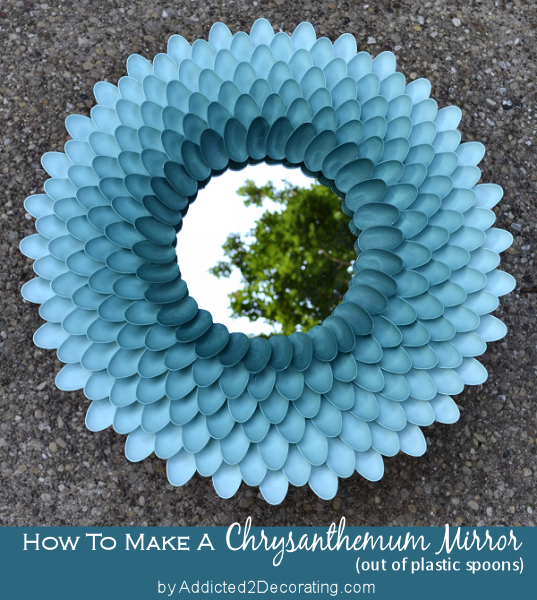 I wanted to make this mirror, which I saw on Addicted2Decorating. I had to do something with all those Starbucks stoppers I was collecting! Particle board ring/wreath from Michaels, hot glue, gold craft spray paint, mirror...that's it!!! It does need a hanger. Now if you JUST would have finished this like a week earlier you could have entered out LESSology challenge which was to alter a mirror! LOL!! I loveeeeeeeeeeeeeeeeee it!!! Looks AMAZING!!!!!! Linda, you are so creative!!!! I can't even believe that these are Starbucks stoppers! So cool!!! It turned out fantastic!